Two men who escaped from a prison van and went on the run in the Netherlands, have been returned to a UK jail. 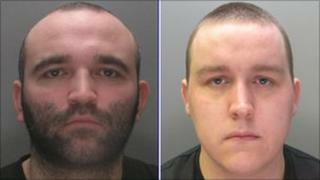 Kirk Bradley and Anthony Downes, from Huyton, had been wanted since July 2011 after escaping from the van on their way to Liverpool Crown Court. They were extradited back to the UK after being caught in the Netherlands earlier this year, police said. Both were convicted in their absence, at Woolwich Crown Court in March, of firearms charges. The men were ordered to serve a minimum of 22 years in jail after being found guilty of conspiracy to possess firearms with intent to endanger life and conspiracy to cause damage with intent to endanger life. Downes, 26 was captured in Goes, Zeeland, on 9 March and Bradley, also 26, was detained on 5 April, in Amsterdam. Ian Milne, from the Serious Organised Crime Agency (Soca), said: "Working with Merseyside Police and the Amsterdam Police led to the capture and extradition of these two violent and dangerous individuals. They are now behind bars in the UK where they belong. "This shows that criminals who flee to other countries are not beyond our reach." Bradley and Downes, who described themselves as "blood brothers" at trial, ran a criminal network between 2009 and 2010. The gang carried out shootings and operated on behalf of others in the Liverpool underworld. The grenade was left on Mr Dalglish's front wall in July 2009, when he was not Liverpool's manager, but it was not intended for him.